With the number of footwear choices out there, it's no wonder you can gaze blankly at the wall of options with a "deer in headlights" stare. A few years back I spent my entire BWCA adventure trying to dry out my hiking boots; a mistake I swore I would never make again. I had to accept the fact that no matter how careful I was, at some point I was going to get wet, so just plan accordingly... Paddling booties just don't cut it when portaging a canoe over a mile long trail, so something a bit more substantial would me necessary. Water shoes were the answer. Things have come a long way from the Aqua-Socks of the 80's. Many of today's options look and perform more like traditional footwear, but have been designed to shed water quickly and have been made from materials that tend to absorb less water. How and where you plan to wear them are the key factors in selection. Teva, famous for water friendly footwear, provides a versatile option for those of us that just like to get wet. The Churn water shoes are masters at the wet - dry transition. Literally under a minute after plunging into the lake and back on the trail, these shoes feel dry as a bone. 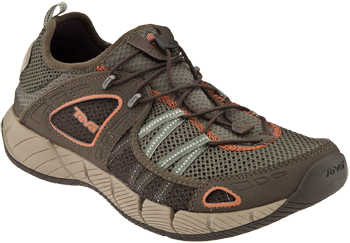 I put over 20 miles of hard portaging and off-trail exploring on these and never once did my feet complain, they are as comfortable as any trail runner I have owned. The speed lacing system is dependable, which is key when you have a 50 pound canoe on your shoulders. Stopping to tighten up your kicks, not a small deal at that point. Looking for something a little less performance minded for around camp? These can fit that bill as well. The heel folds down to allow wearing them clog style. 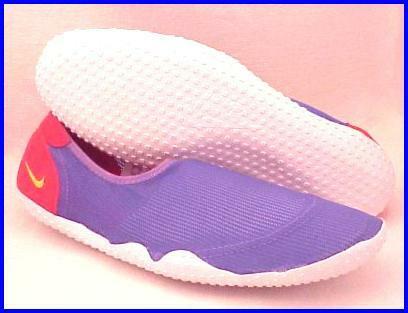 The "shock pad" attached to the outside of the heel adds grip and cushion when worn this way. I have to admit, there were a couple of times I was wishing the Churns had a bit more traction. The soles are tacky when wet, which is perfect for slick rocks or boat decks, but I would prefer something a smidge gnarlier for hiking and back-country trails. I do feel that the water-shedding abilities and comfort of these shoes outweighed the lack of traction though. These are not single purpose shoes either. Mine see plenty of action when the weather man mentions the word rain. If I'm gonna get wet, these shoes will be on my feet.